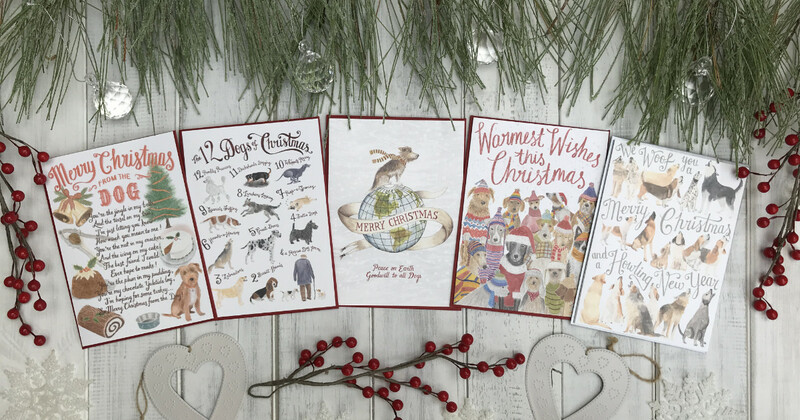 This year there are 4 Christmas card designs available and again, 50% of the profits from the sale of the cards will be donated to Hearing Dogs and Cinnamon Trust. Cards are sold in packs of 10. They are printed in the UK on luxurious, thick, textured card and are blank inside for your own personal message. They measure 128x179mm. "I just received my order of the three different dog Xmas cards and I wanted to say how much I love them. I knew they would be beautiful but they far exceeded my expectations. I know my clients, friends and family will love receiving them. As I am in Canada and with the exchange rate the cards were more than I initially wanted to spend on Xmas cards but they were so worth it. Not only because they are so unique and beautiful but because it supports an independent artist and how part of the proceeds are donated to charity." 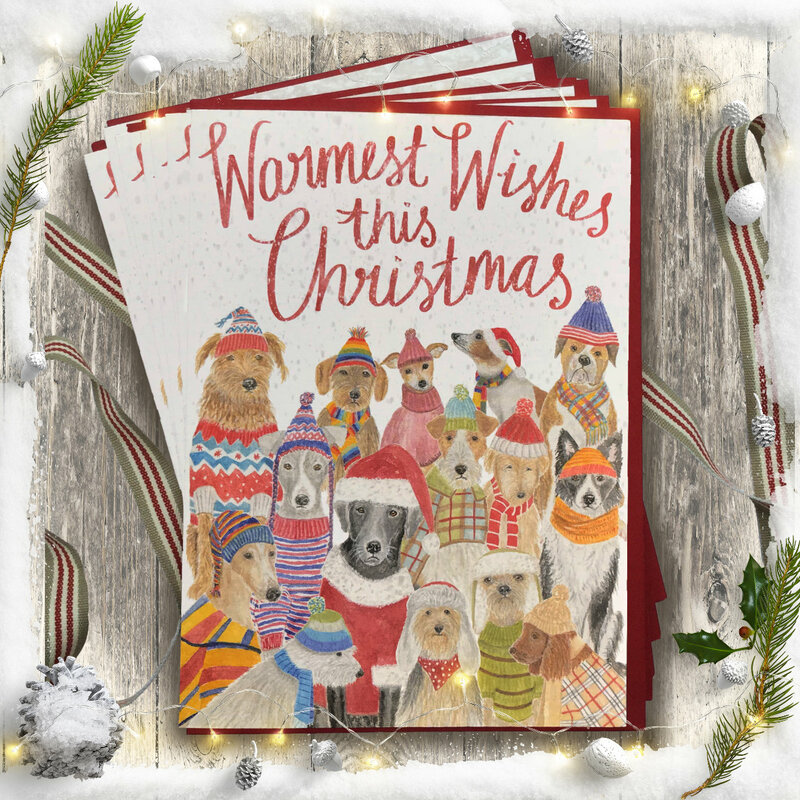 The “Warmest Wishes” Christmas card features a motley collection of warmly dressed dogs. Painted in watercolours, they sport a variety of coats, jumpers, hats and scarves with the message "Warmest Wishes this Christmas". Comes with a festive red envelope. 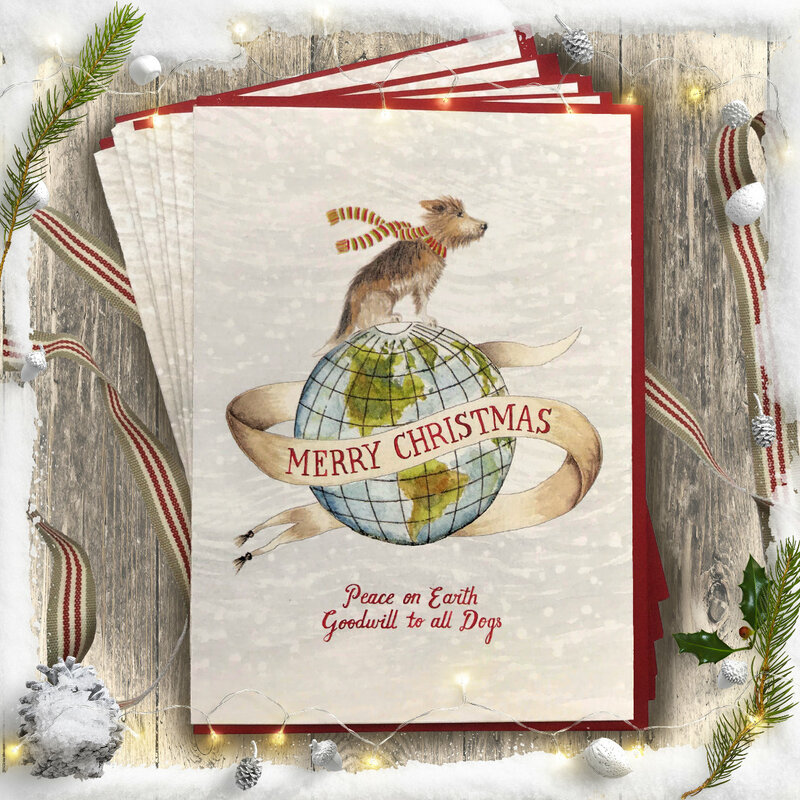 The “Peace on Earth” Christmas card features my hand drawn letters and watercolour illustration of a scruffy dog perched on top of the world in the swirling snow with the Christmas message "Peace on Earth, Goodwill to all Dogs". Comes with a festive red envelope. 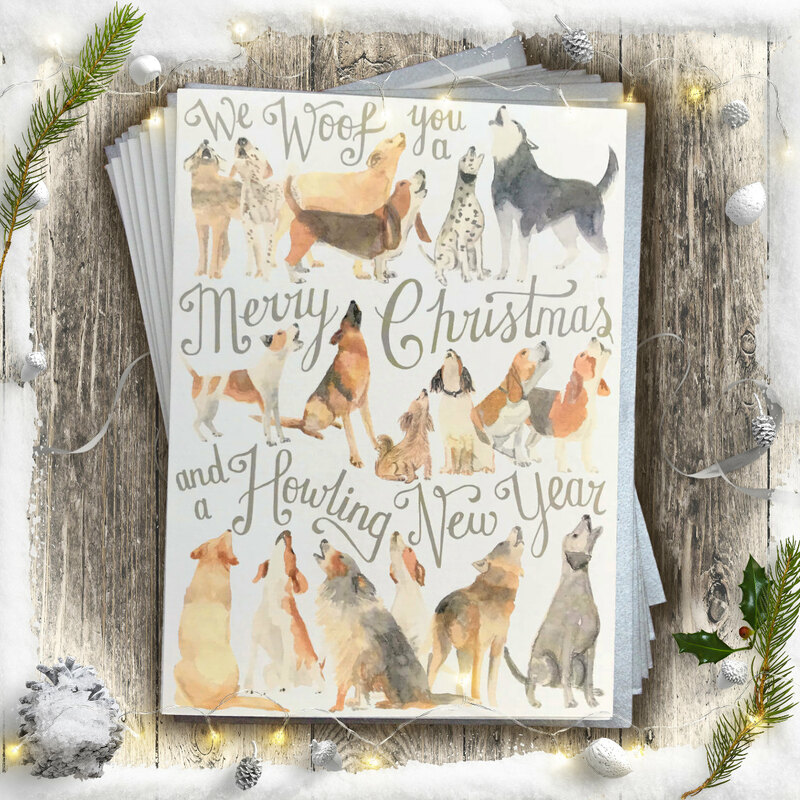 The “Howling Dogs” Christmas card features my hand drawn letters and watercolour drawings of a variety of howling pooches, woofing and singing a joyful festive message for the holiday season. Comes with a metallic silver envelope. 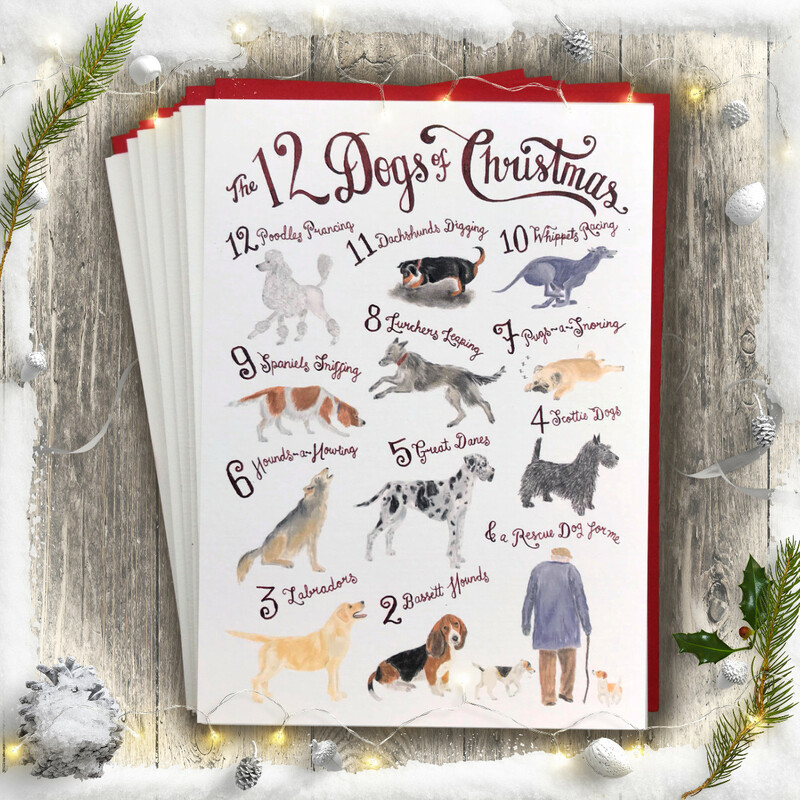 Featuring my hand-drawn letters and illustrations, the “12 Dogs of Christmas” card is a doggy twist on the traditional cumulative song “The 12 Days of Christmas”, which dates from 1780. Comes with a festive red envelope. Super impressed! I ordered the ‘Howling Dogs’ Christmas Cards yesterday afternoon, and have just received them this morning ... They’re even more amazing in real life - thank you so much! What a delightful package to come home from work to find! Christmas cards ordered Friday and arrived today! My doggie owning friends will be delighted to receive these I'm sure! And donations to charity too - wonderful, thank you so much!